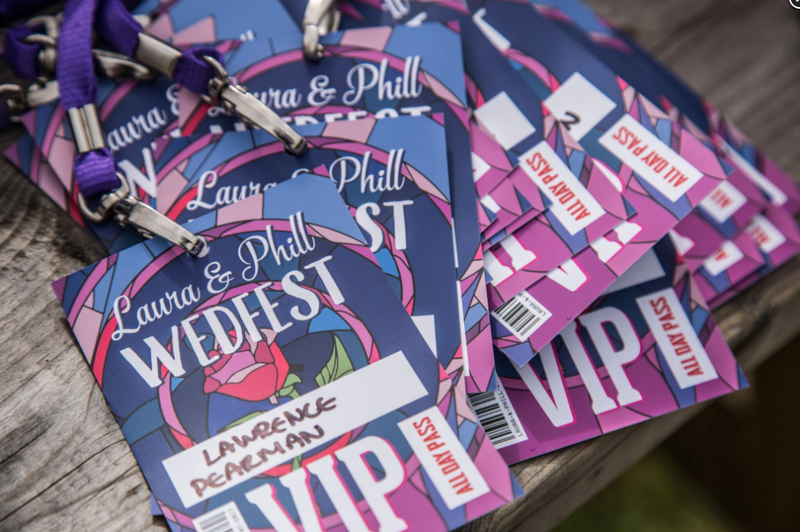 As a wedding guest, there’s nothing more exciting than receiving your invitation in the post and opening the envelope to reveal a backstage pass and a fabric wristband! (You can design your own wristbands and they make a great keepsake). Bring the festival vibe right from the start, making sure your invitations follow the theme of your special day. 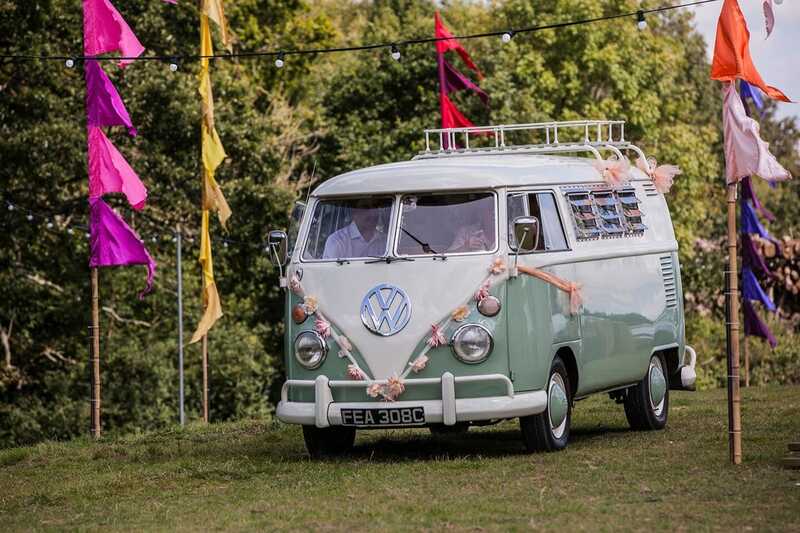 Ideas include a Flower Power Woodstock theme, a shabby chic whimsical woodland festival, Rock n Roll, Bluegrass or Country, relaxed Reggae, Jazz, Indie Rock, Folk… the possibilities are endless! As this is going to be no ordinary wedding, your guests are going to need plenty of extra information. Will they need to bring a tent? Will there be bathroom facilities on site? What should they wear? Are umbrellas provided? If you envisioned your guests dancing around in black tie and Hunter wellies then make it clear. A checklist is essential for a big knees up such as this. 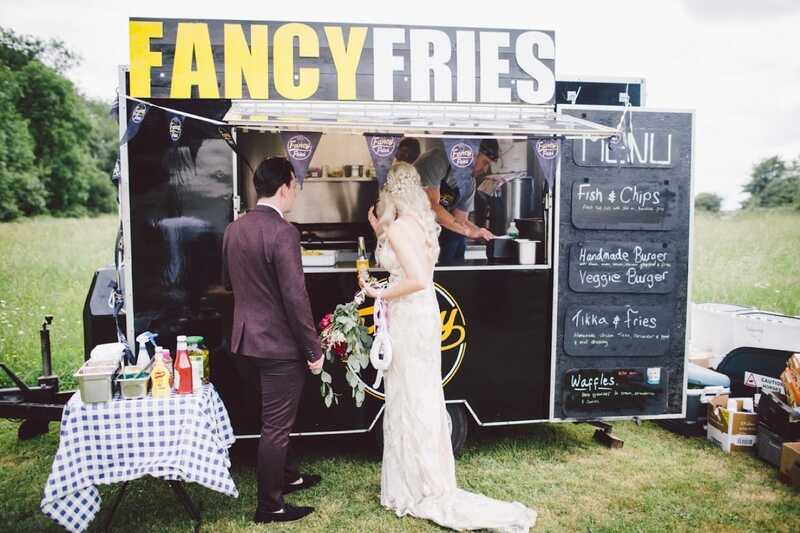 If you aren’t able to hire a big piece of land or don’t have a family member or distant relative with an unfeasibly large garden, don’t worry, you can still have a festival-themed wedding! 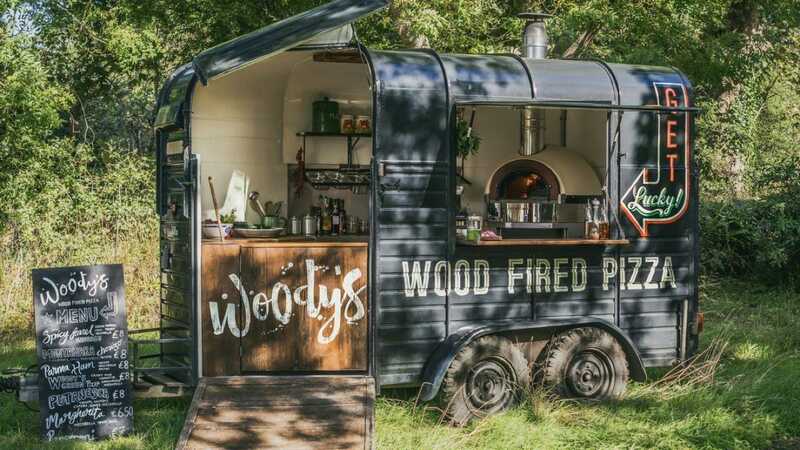 Many wedding venues, especially rural ones, are now ‘festival-ready’ and you’ll be surprised at how many local pubs will be willing to let you jazz up their beer gardens for your Wedfest. 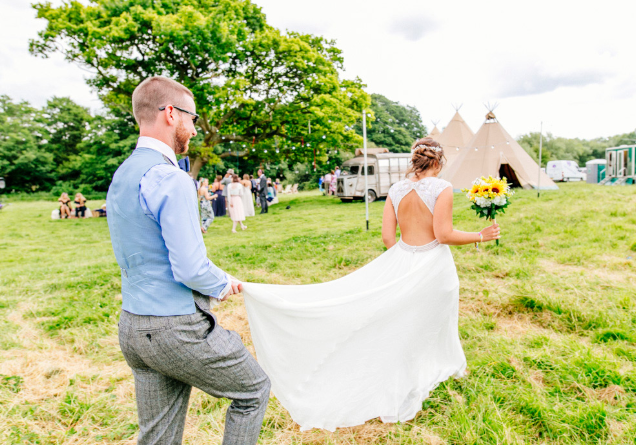 If you’ve found the perfect festival field, why not stretch your nuptials over a weekend and have your guests camp on site, dancing around their yurts until the sun comes up? Top tip: The UK has regulations on where legal ceremonies can occur, so make sure you check your site. You might have to get married somewhere official and have the reception at your festival site. 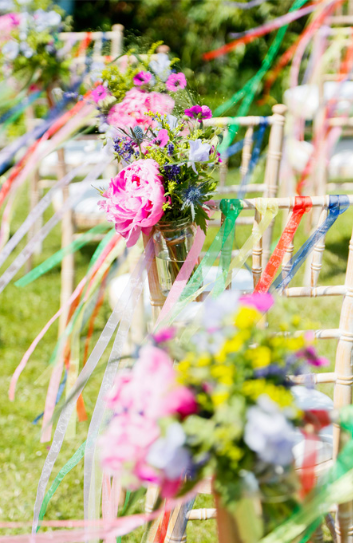 A festival wedding doesn’t really scream ‘cathedral ceremony’, so it’s a good idea to find a relaxed and cosy venue near to the festival site where your party will take place. 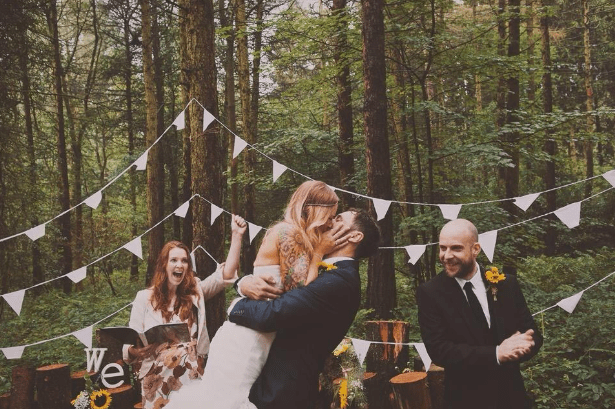 For the more nomadic couples out there, why not tie the knot in a romantic woodland setting, with glowing lanterns hanging from the trees and a bouquet of trailing ivy? 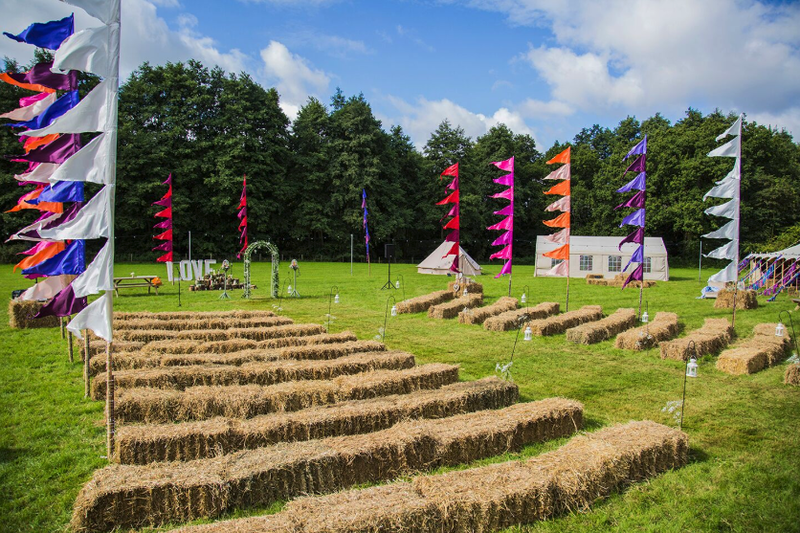 It’s important to hint towards the festival theme at the actual ceremony, which can easily be done with bunting, blanket covered hay bales and a folk band playing as you walk up the aisle. 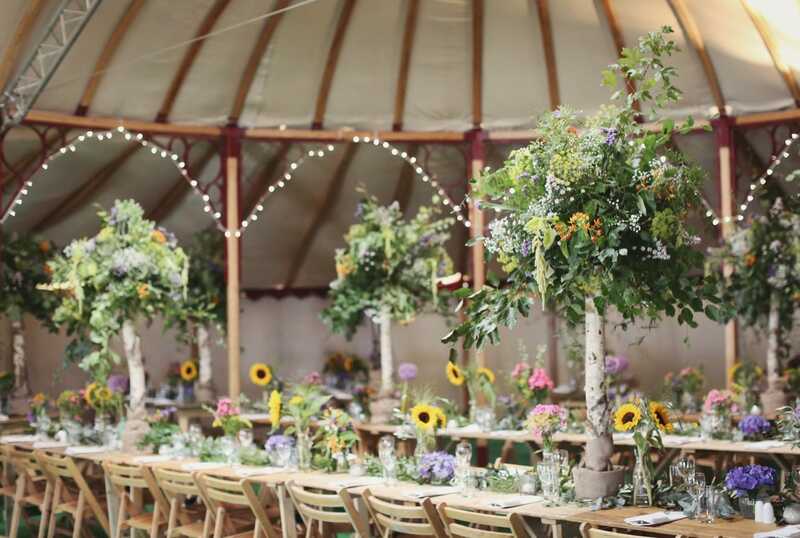 If you’re working with a big space, then hiring tents, tipis and marquees is a great idea and offers the perfect place for speeches, meals and your first dance, not to mention somewhere for your guests to take shelter should the heavens open. Once you’ve got these structures set up, it’s really easy to decorate and make them totally your own. 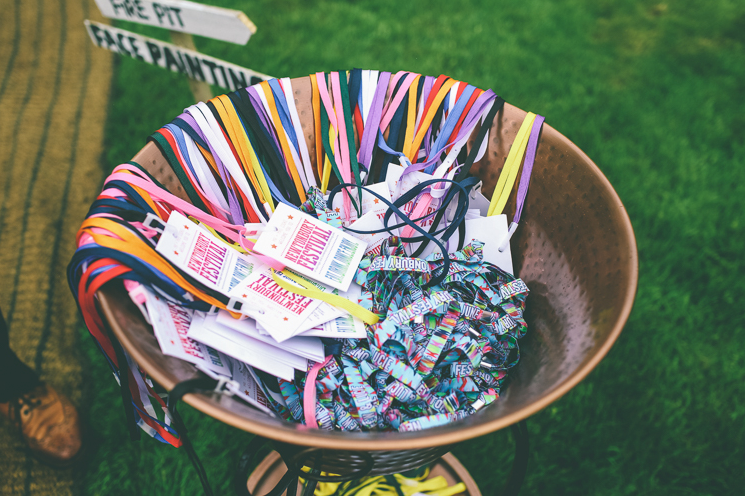 For a shabby chic festival wedding, think oversized pastel coloured balloons, bunting, bright ribbons tied into trees, festival flags, enormous wooden lettering for your guests to take photos in front of, and lots and lots of flowers! Lighting is the absolute key and bad lighting will really make itself known when the evening comes. It needs to be moody and atmospheric, created using fairy lights and lanterns… no industrial lighting allowed! 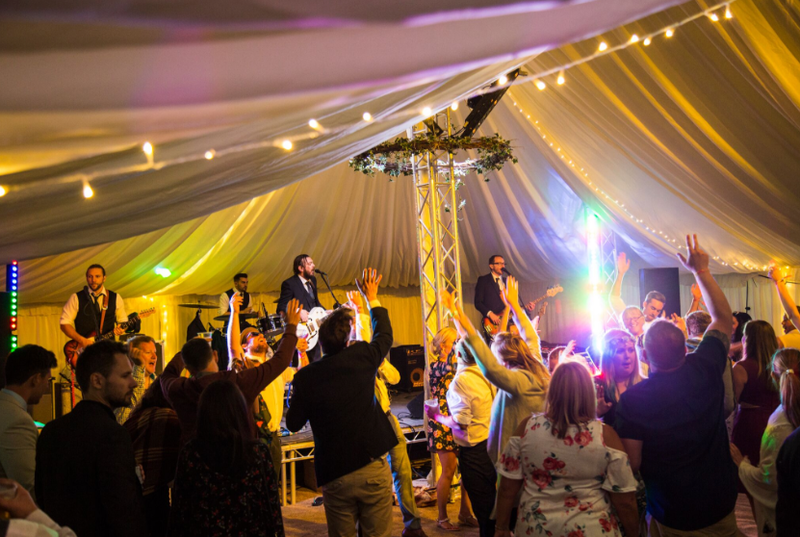 The great thing about having a festival wedding is that your guests won’t be expected to spend the whole night on a sticky dance floor, bobbing along to cheesy tunes. 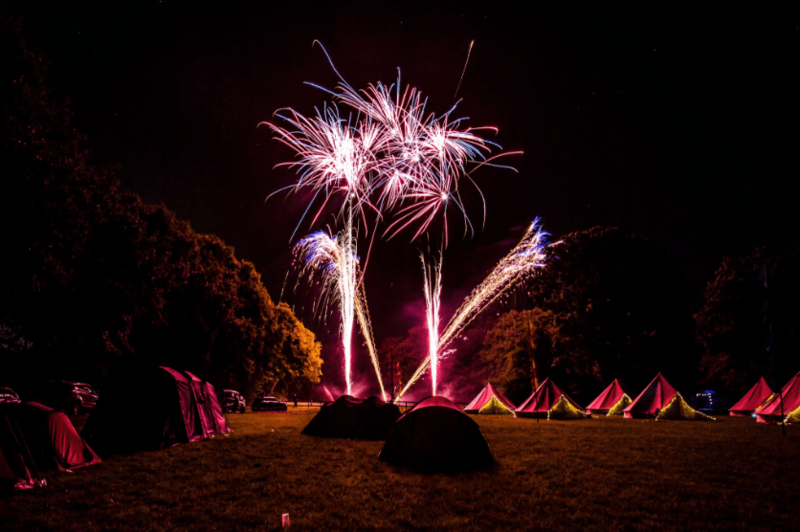 The concept of a festival creates so much opportunity for activities to make your special day impossibly unique! A hand painted wooden signpost can point your guests in the direction of dancing, a photo booth, slacklining, face painting, flower crown making or a glitter bar, where ladies (and gentlemen) can get made up with the most amazing glitter and gem stone designs on their faces (or beards). If you’ve got children attending your special day, you’d be doing yourself and their parents a favour by providing some kids entertainment too. 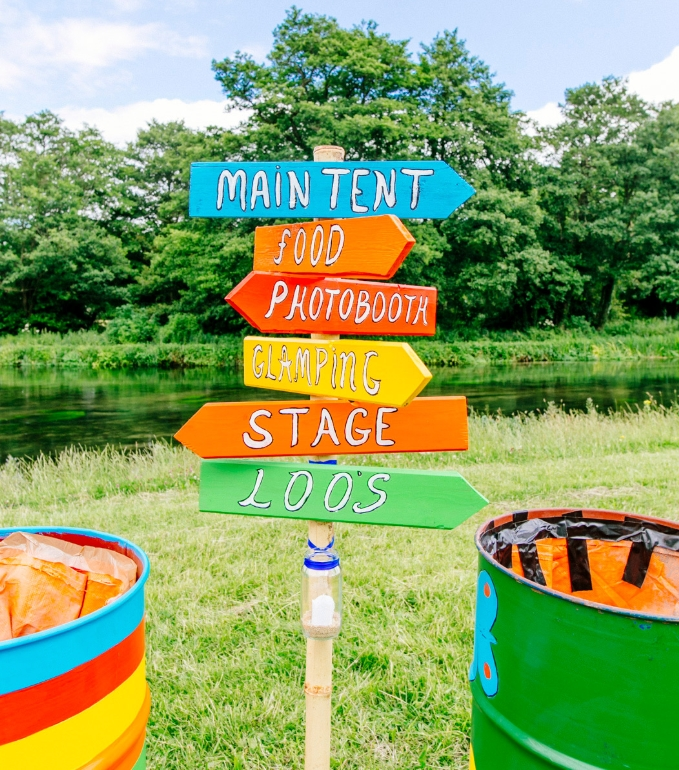 Think giant jenga, hoola hoops, bubble machines, scavenger hunts and a bouncy castle. Top tip: A bouncy castle doubles up as grown up entertainment once the children have gone to sleep! Great live music is absolutely key for your festival wedding. In the afternoon, treat your guests to the dulcet tones of a local folksy band, before a DJ playing dance floor fillers takes over and keeps everyone going until the early hours. The possibilities are endless when it comes to music. You can hire all manner of musical entertainment, from Big Bands and jazz bands, to gospel choirs and steel pans. For the biggest entertainment value and dancing/sing along opportunities, a decent cover band should do the trick! Top tip: Be sustainable! Don’t leave a bad mark on the landscape where you had your wedding. Leave plenty of places around for guests to put their rubbish, use wooden forks, paper straws and disposable serveware for your food and drink to minimise your impact! 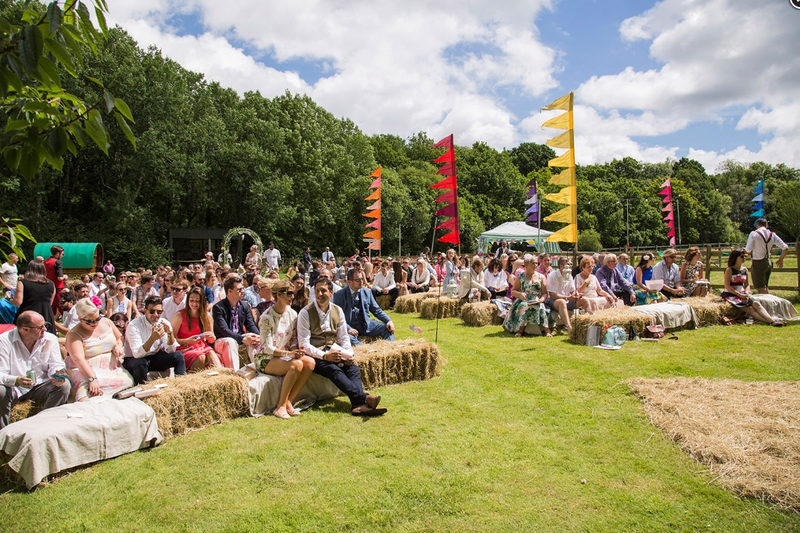 So there you have it, the ultimate guide to organising a festival-themed wedding, just keep your fingers crossed for the weather… It’s a really good idea to get the food and drink nailed early, especially if you are getting married in the summer months as the best ones often get booked up quite far in advance! Check out our awesome caterers here. We only invite the country’s most creative, experienced and delicious caterers onto the Feast It platform, so we can guarantee that these really are the best.